That's Malapai Hill out there in Pleasant Valley. I parked old Blue at the trailhead for Pinyon Well Canyon and points beyond, located at Stop #15 of the Geology Tour Road. There's a great view of Pleasant Valley and Malapai Hill from the trailhead, so I had to take a picture. But after that, it was time to get hiking. I had three historic places to find along the trail and I was anxious to be on my way. It was a great day for hiking, only marred by a few mean flies and a heavier-than-I-needed daypack. The sky was blue, the temperature mild, there were new things to see and I had the canyon to myself. I commenced hiking. My first destination was Pinyon Well and it wasn't long before I found myself in a "cozy nook" in the canyon. 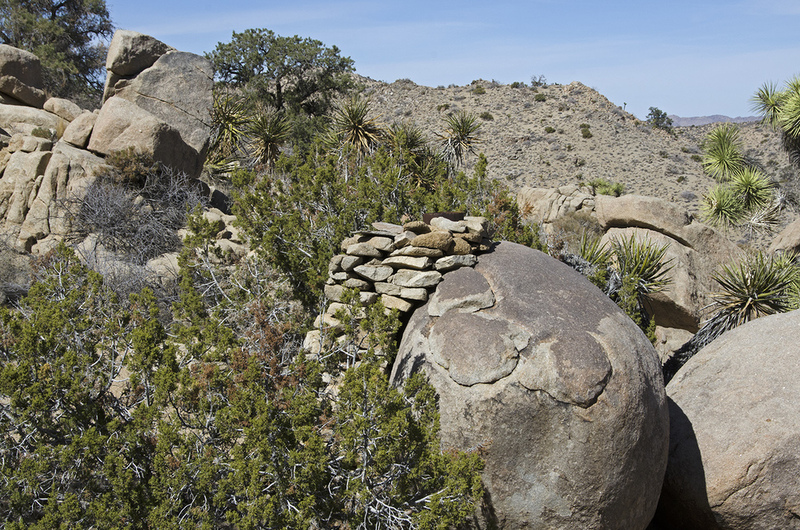 Pinyon Well was a small, active community in the late 1890s and up through the 1910s. It was there because of a reliable source of water from three wells in the area, and the steam-powered, two-stamp mill that crushed ore for the nearby mines. 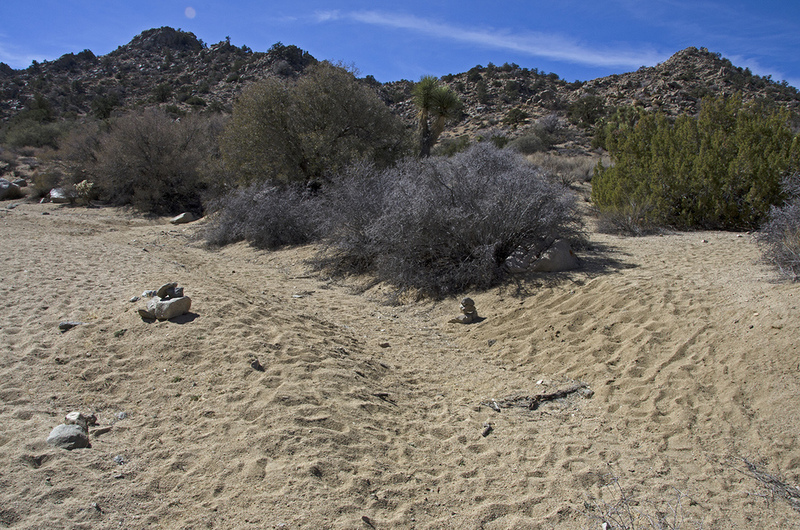 A round-trip hike from the trailhead to Pinyon Well is a little under two miles, mostly walking through a sandy wash that runs up the canyon with a slight elevation gain. I'd rate it as easy and well worth the trek. 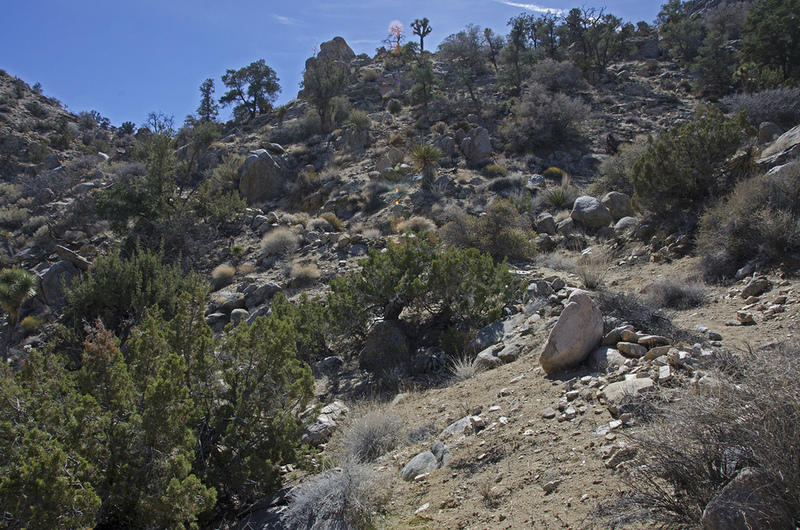 Take a look HERE to see my full post about Pinyon Well. After exploring the area and taking a crazy number of pictures, I resumed my up canyon trek. Just a little ways past the last of the Pinyon Wells that I located, maybe 40-50 yards or so, I saw a grey pile of tailings that typically sets off the "MINE MINE MINE" alert system in my head. However, its close proximity to the other wells in the canyon makes me wonder if someone was digging for water, not for gold. The hole is fenced off and caved in, so not really much to see. But on the other side of the canyon I found several bedrock mortars that indicate Native Americans once spent time in the area. Possibly the Chemehuevi or Cahuilla people. It makes sense, with a good water supply, shady canyon walls and abundant wildlife, this would have been a good place to live during certain times of the year. More boulders with these white bands. 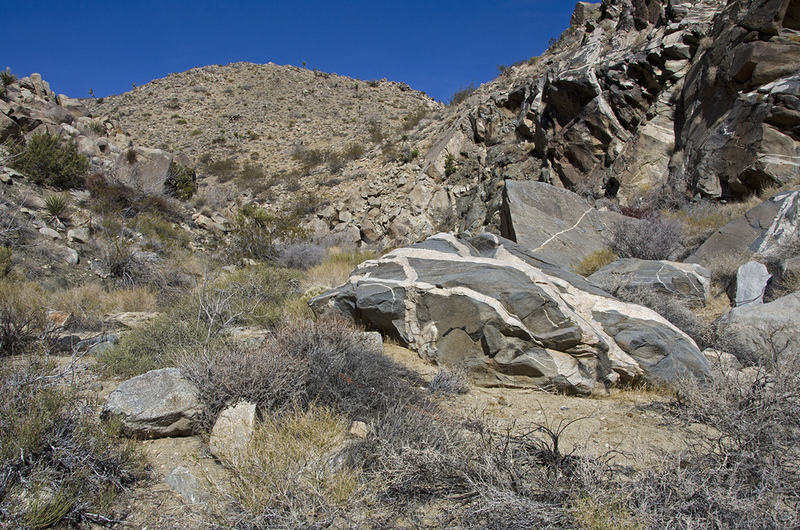 Just past this white-banded boulder, a rock slide blocks the canyon floor, but a path to the left side easily got me by. Ha, Intrepid Hiker 1, Rock Slide 0. Once past the slide, I saw two amazing things. The first thing that jumped out at me was this huge slice of blue rock with the wide pinkish band. Could this be a splinter of the Blue Cut Fault that runs near this area? I don't know, but that's what came to mind. The second amazing thing is not as impressive looking, but impressive enough in its own right. What appears to be hard-packed dirt to the right of the blue cut, is pavement. Yes, pavement. 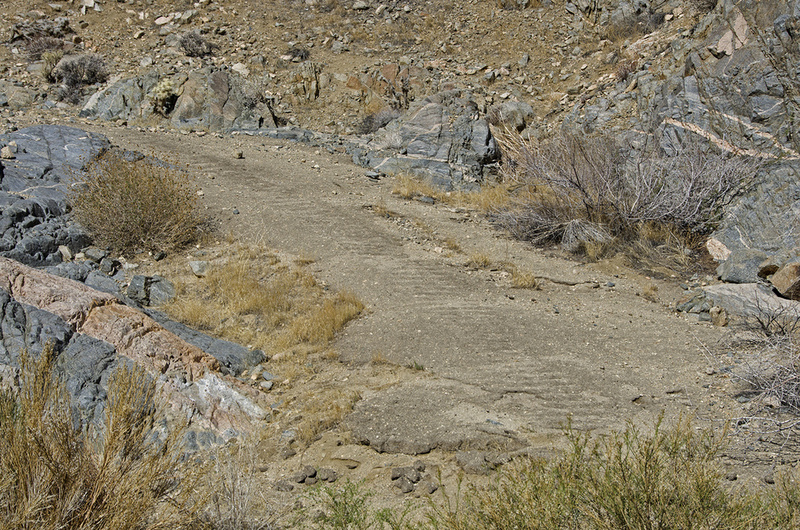 Apparently, at some time in the past, the Pushawalla Canyon Freight Road was paved. I don't know if it was just this section here, or a longer portion, as this was the only signs of pavement I saw on this hike. To me, that's amazing. Yes, the magic Garmin guided me in the right direction. Just around the right hand side of the gore point in the trail, I found The Guzzler. I had never heard of a guzzler before I researched this spot. A guzzler is simply a device that provides water for animals to drink. What makes this one so interesting, is the ingenious method of collecting water and the size of the catch system. First view. The actual guzzler is almost dead center in this image, look for the small metal object. The Guzzler, up close and personal. There wasn't any water in the guzzler when I visited. I don't know if that was a result of no rain over the past four months or so, or if there was a problem somewhere along the delivery system. Rain is gathered from the large wood frame structure on the left. That's sheet metal covering it, like a roof on a very short building. The water flows down the sheet metal, into a rain gutter. And from the rain gutter, a pipe drains the water into the large structure below. And the rain water from the pipe flows into the huge storage tank inside the lower structure. I wish I had thought to bang on the side of the tank while I was there, to see if there was any water in the tank. I have a hunch it was empty, though. From the storage tank, the collected water would then flow down to the guzzler and provide drinking water for animals in the area. This particular guzzler was constructed in 1978 by the National Park Service, mainly to provide a water source during drought months for Bighorn Sheep. As a side-note, a small herd of feral burros used the guzzler in the early 1980s. They were removed from the park in 1986. 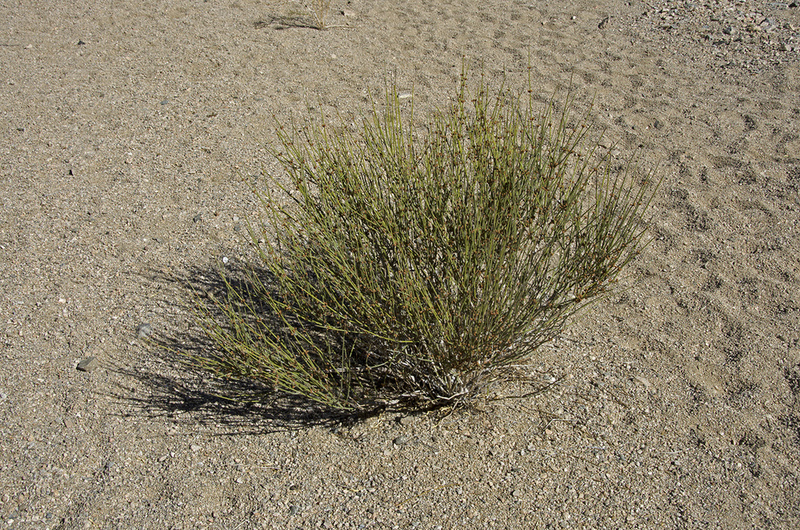 To read more about guzzlers in J Tree and the controversy they raise, click HERE and search for keyword "guzzler." It' pretty interesting. After closing the door and latching the latch, I took a brief rest and then backtracked to the main canyon to resume my trek and press on to my final destination of the day. The wash was now heading in a southwesterly direction and I knew I would soon reach my next landmark. The trail to this point had been pretty easy to follow, with very few opportunities to go astray. These are the kind of trails that make me happy. About 1/3-mile beyond the guzzler, the wash will take a turn directly south. 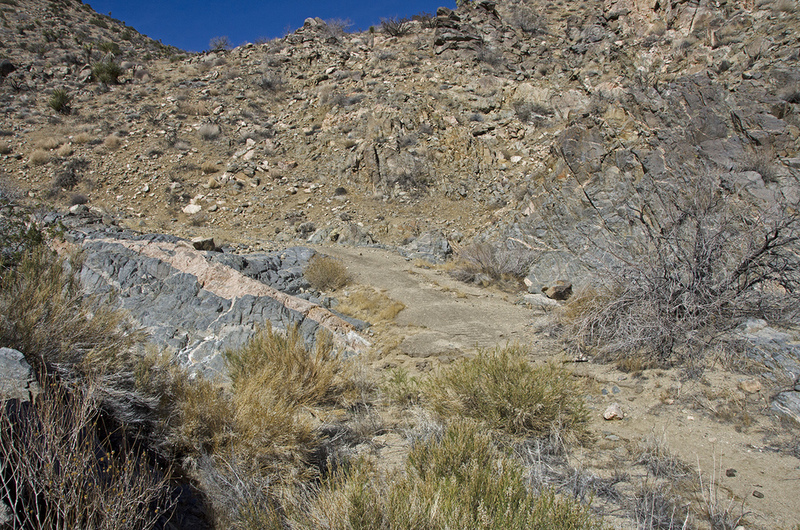 A couple of small cairns mark a side trail that heads west from the wash. That is a trip for another day. It leads to Pushawalla Pass, a number of interesting mines and Pushawalla Plateau. I'm looking forward to that hike. After continuing along the trail for about a tenth of a mile, I noticed this rock cairn in the middle of a small wash that headed up into those hills beyond. Thank you to whoever left it! I could almost smell the mines and old ruins that I knew were up there, waiting for me to find them. Off in the distance, I saw traces of what could be the old mining road that would lead me to Hensen Well Mill. This little cut seemed to be heading in the right direction, so I started walking. It seemed easiest to hike right down the middle as the walls on each side were very sandy. 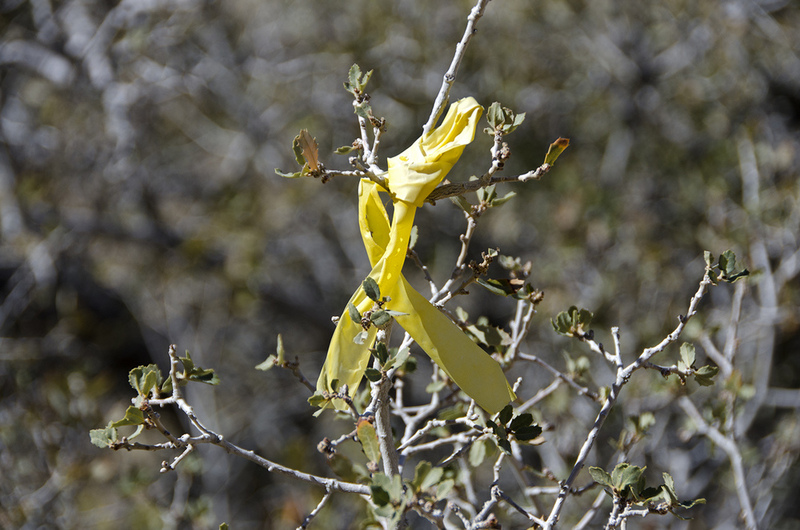 After walking a bit I saw something yellow up ahead. I don't always count on markers like this to be going to the place I want to go, but as I didn't know of anything else up here, I figured it was marking the trail I needed. And as it turned out, it was. Not much farther past the little yellow helper, I saw a pile of grey debris that looked suspiciously like mine tailings. Those are like a magnet to me and I headed straight over to check it out. Definitely mine tailings, and a few pieces of old pipe. 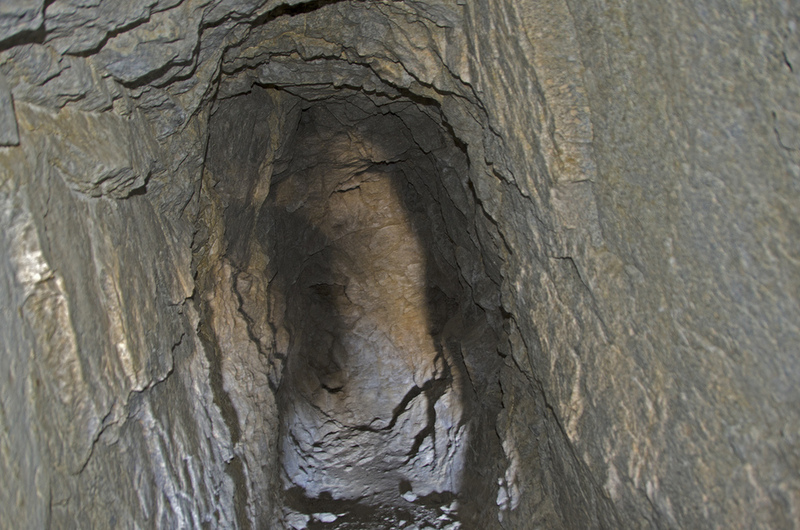 The mine tunnel was chiseled into solid rock and went back about 20-25 feet or so. I wandered to the back of it, but there wasn't anything of interest to see, except the tunnel itself. It took a lot of work to dig/drill/chisel out this thing. After making sure there were no huge chunks of gold in quartz laying around anywhere, I headed back down into the little ravine to try to pick up the old mining road. After climbing up what I like to call the 'sandy hill of death,' I spotted the rocky road just ahead. Every time I see the remains of a road like this one, I wonder what it looked like when it was first built. Was it wider? Smoother? Maybe this last section was only used by pack animals. I felt like a pack animal at this point and took frequent rests along this last stretch. But all the effort was soon to be rewarded, as not far from this point I found an amazing place. Hensen (sometimes spelled Henson, Hansen or Hanson) Well Mill has moved up to the top of my "Favorite Places" in J Tree, due to the number of old stone ruins, desert gold and the Chilean Mill grinding stones located on the side of this mountain. This is the first of five stone building ruins I was able to locate at Hensen Well Mill. Was it a cabin or bunkhouse, or perhaps a mine office of some kind? I don't know. There's no real information that I could find which would reveal if Hensen Well Mill was a camp where miners lived, or just a place of work. This is the same ruin, the picture taken from the slope above. I hiked quite a way up the hill, but didn't find anything of interest, so headed back down to the small ravine and continued up canyon. Not very far from the first ruin, I came upon the second stone ruin and something even more important right in the middle of the trail. Nearly covered by vegetation, one of the iron-banded, cement crushing wheels of the Chilean mill was lying right at my feet. This was way cool. So what the heck is a Chilean Mill and what was it doing up here in the Little San Bernardino Mountains? 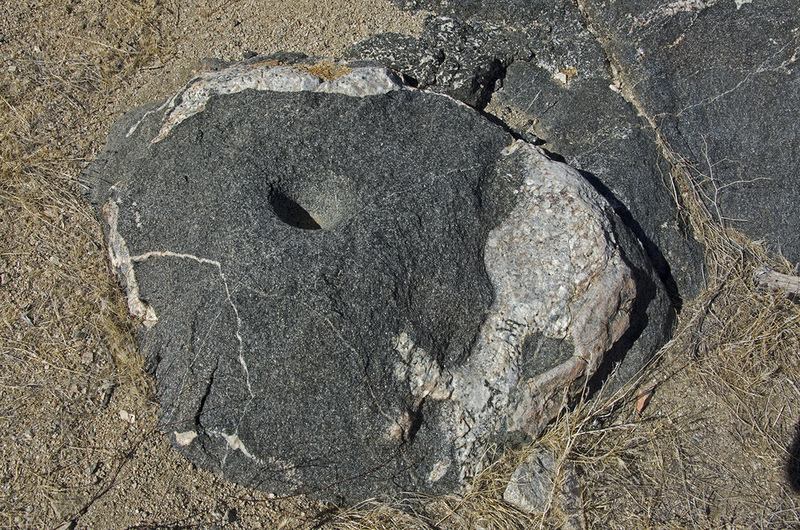 A Chilean Mill is very similar to an arrastra, but instead of dragging large rocks around in a stone channel to crush ore, heavy wheels like this one above were used to roll over the ore and crush it into smithereens. Wheels would make its operation easier. The picture to the right is of the wagon wheel arrastra over at Pinto Wye. Imagine the stone wheels at Hensen Mill attached to the wood axels. As the mill turned, the stone wheels would roll along the channel and crush the ore inside. Hensen Well Mill most likely did custom milling for the local mines in the area and is known to have been in operation as late at 1914. I imagine it took a couple men to turn the mill, those cement wheels must weigh a lot. Here's a closer look at the ruin near the first grinding wheel. It's in pretty good condition. I'm not sure if the metal pipes at the back where part of the structure, or just placed there by someone at some point in the past. There are some wooden timbers at the back that may have been part of a roof. Wandering around the area, I spotted something obviously man-made across the ravine, so headed on over to investigate. What could it be? It was one of the coolest finds of the day. This old stone chimney built against a large boulder. There is a nice flat area in front. 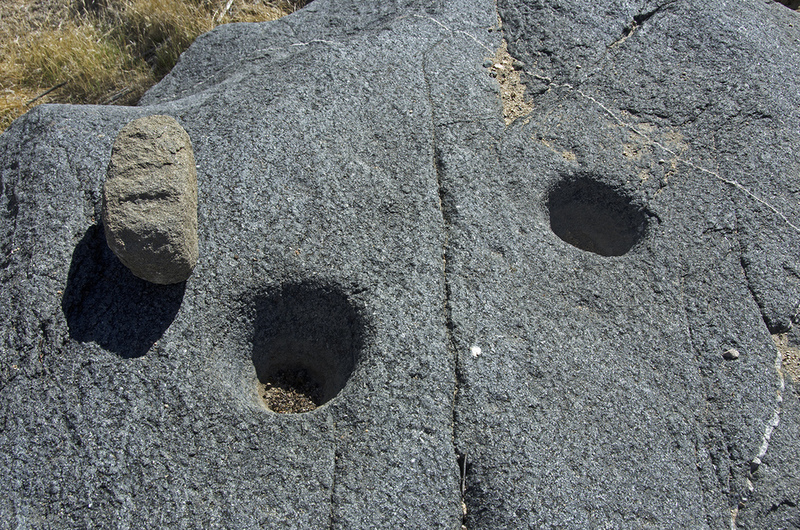 Maybe this was an outdoor kitchen? Or was the chimney part of a building? I didn't see many stones where walls would have been, so I am doubtful that there was ever a stone cabin on this site. I headed back down and crossed back over the ravine to reach the next stone ruins. This one is fairly large. This ruin also had the largest amount of desert gold scattered about. You can see the wood scraps in front that were probably part of the roof at one time. There are a lot of cans, broken bits of glass, miscellaneous pieces of pipe and wire scattered around this ruin. Maybe it was the place where everyone got together after work, or maybe it was a large bunkhouse. I spent quite a bit of time poking around this one. After looking at a lot of interesting things, I made my way a little farther up the canyon. I'm sure that when this place was really active, the little flat area here that held Hensen Well Mill must have been free of all the brush that is there now. It's pretty overgrown and I'm sure the vegetation is probably hiding some cool stuff. So as I was wandering through the grasses, hoping to not step on a rattlesnake, I was totally surprised by what was in front of me as I entered a little clearing. I had found the second grinding wheel that I knew was up here somewhere. In fact, this one is still in place in the channel of the old mill. You can see a few of the rocks that where used to frame the channel the stone wheels would run in. If you were to dig down in the sand a couple feet, you'd find the stone floor the wheels rolled on. The old timber in front is probably a part of the mill as well. Seeing this one here makes me wonder, how in the world the other wheel got so far down the canyon? Very close to this wheel I ran across this small, cement-lined rock structure. This might be the well site, but it is now filled in with sand. 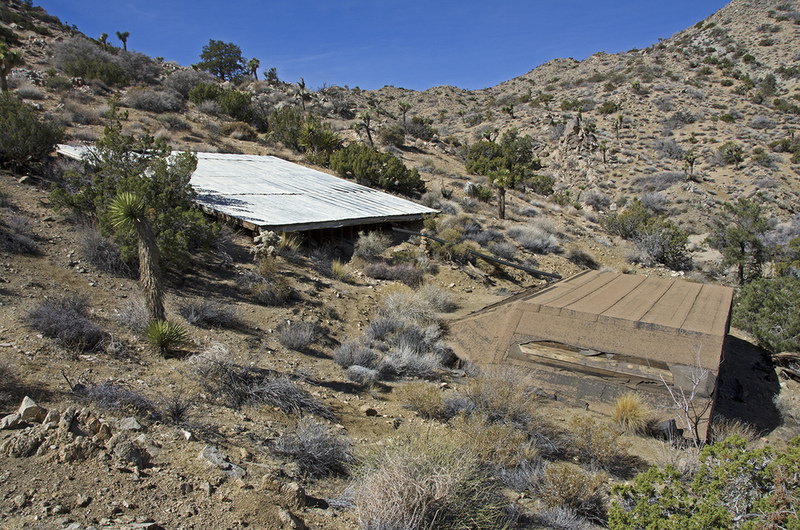 At one time Hensen well helped provide water, along with the Pinyon Wells, to the Eldorado Mine. The possible well site and the second grinding wheel were the last of my discoveries here for the day. 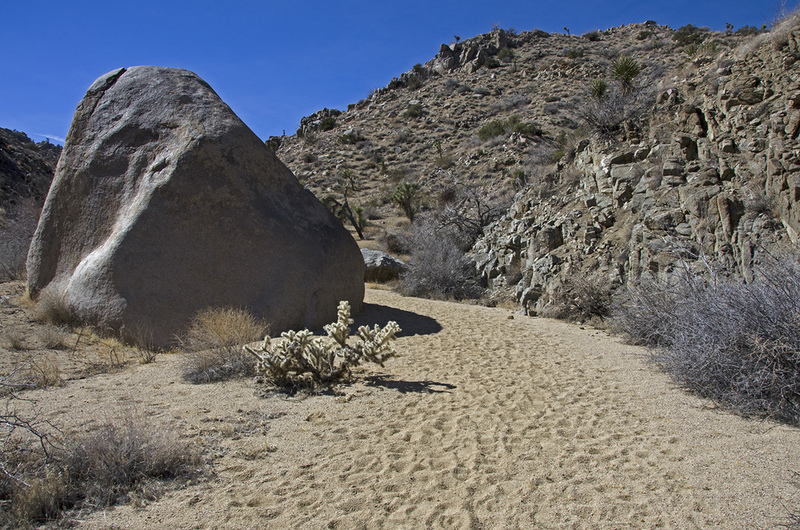 I had wandered about the area for several hours and must say again that it is now one of my favorite sites in J Tree. Its remote location and the lack of any well-beaten trails have helped keep the ruins and artifacts at Hensen Well Mill in great condition. My round-trip mileage was a little over 6 miles and I'd give the entire trail a moderate rating, as there is a bit of elevation gain at the end and some rough roads that had me a bit winded. It was absolutely worth the effort and I'm looking forward to my next trip up Pinyon Canyon, 'cause I'll turn right at the fork and head up to Pushawalla Pass and the mines in that area, to see what I can find. Heading back down the trail after another great day in the park.